Hello! A while back I made these gift toppers, and after rereading that post, I was inspired to make a Christmas project! 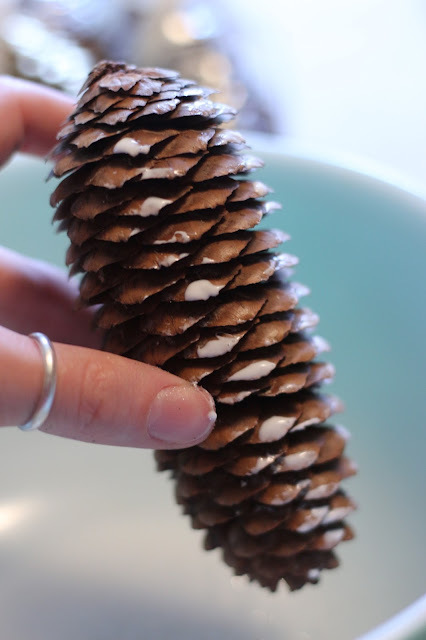 Today I'm going to show you how to turn pinecones into beautiful Christmas tree ornaments. 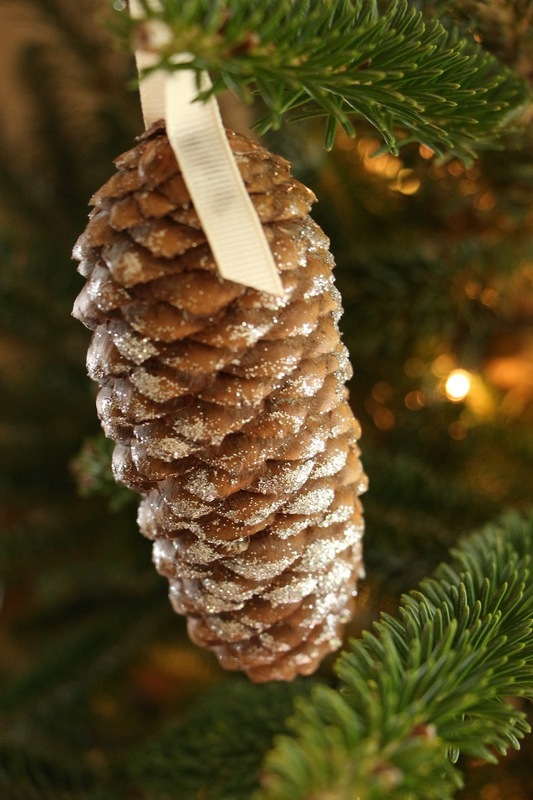 I scoured the forests here in Charleston for pinecones and came back mostly empty-handed. 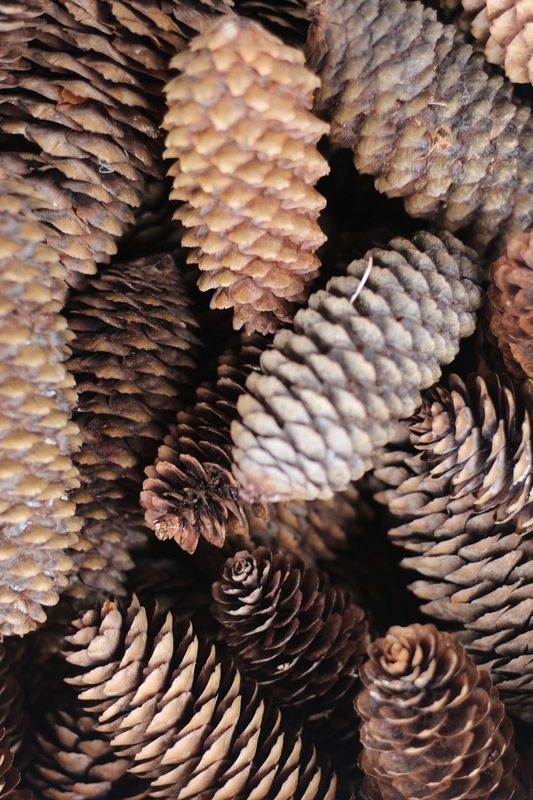 On a run one day, I stepped on a beautiful pinecone and nearly shouted with excitement. My neighbors have a beautiful evergreen that produces lovely cones. Thanks neighbors! 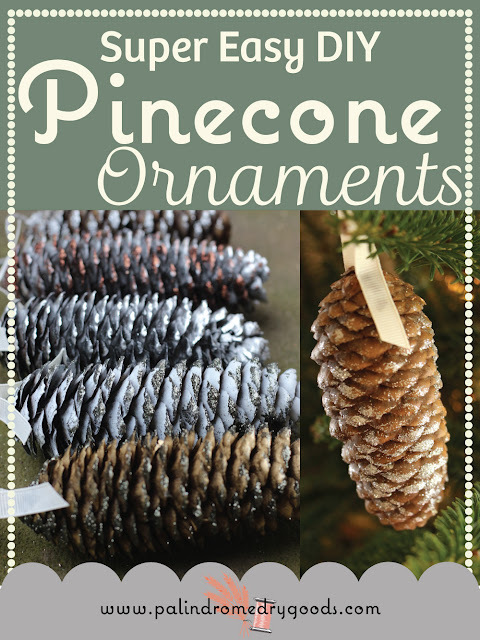 These ornaments are great because not only are pinecones free, but they come in hundreds of different varieties and are a blank canvas for all holiday decorating. 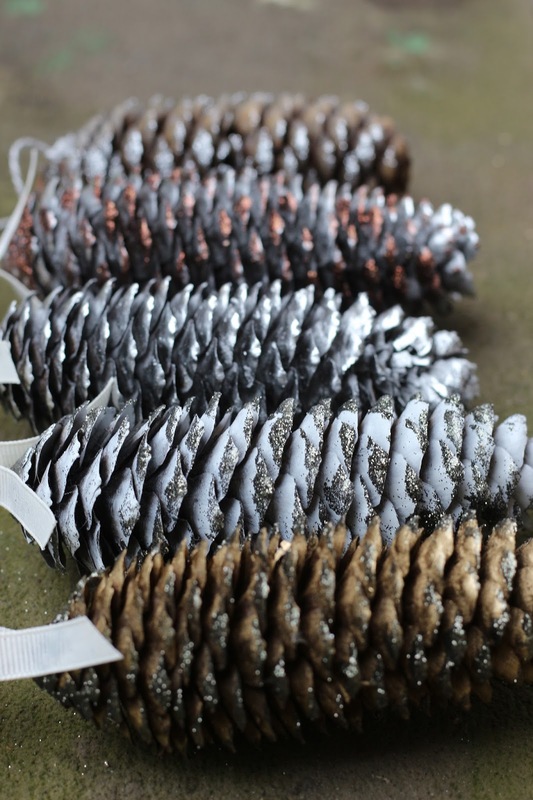 They can be used for wreaths, garlands, ornaments, gift toppers, table settings, mantle additions, the list goes on and on. My fiance is in an apprenticeship program to become an electrical lineman, because of this apprenticeship, we move every 8 or so months and this means that our home is rather temporary. Aaaand because we have a wedding approacing in May (yay!) we're on a tight budget. Decorating on such a budget (and limited room for things) has been a bit of a challenge, and although I really miss my beautiful decorations from home, it's been sort of fun creating new items to decorate with. Craft glue. 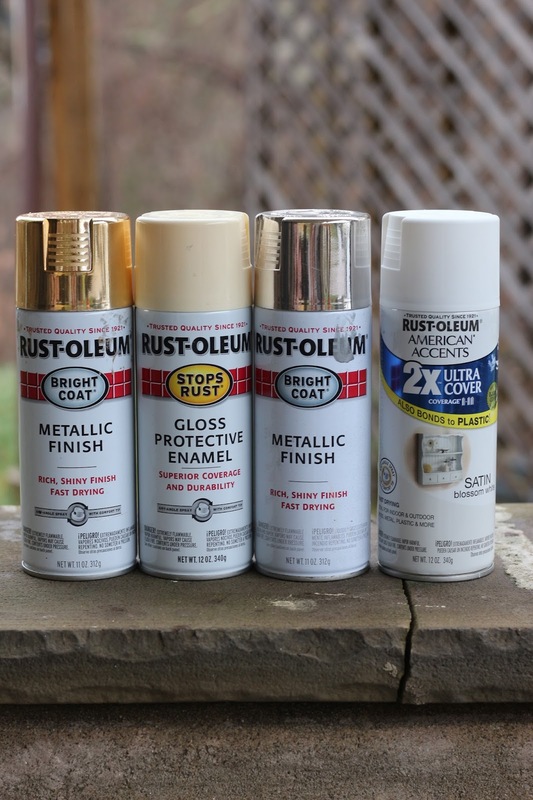 I used Aleene's, but any brand will do. 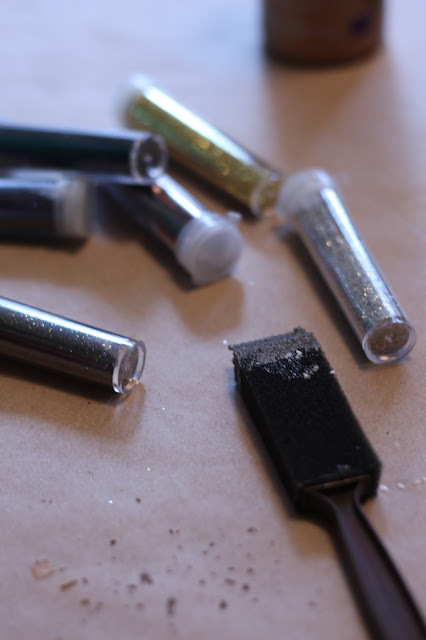 Glitter and a paintbrush that you don't care about, or a sponge brush. I used extra fine glitter (which means my entire home is covered in glitter. I picked pieces of it off of Dan's cheek last night and he wasn't even home when I made these), but if you mixed big flakes of glitter with the fine stuff it would make a beautiful combination. Remember, I'm on a budget but that doesn't mean you have to be! Spray paint. This is optional. 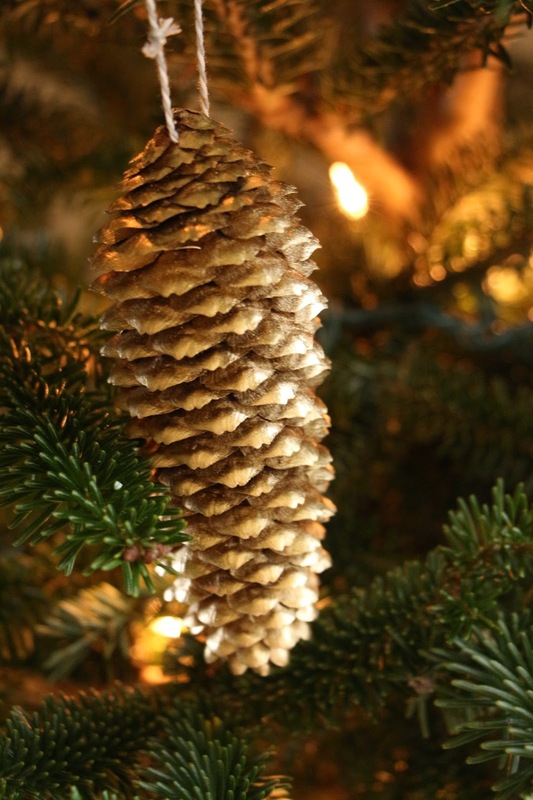 If you like the look of your natural colored cones, then leave them be. I did about half natural, and the other half I sprayed in the below colors. I wanted to spray paint some of my pinecones before I glittered them so I brushed them off with a big, soft, hand brush to get off all the dirt/cobwebs/sticks that were stuck to them. I then placed them in a box and sprayed one side at a time. 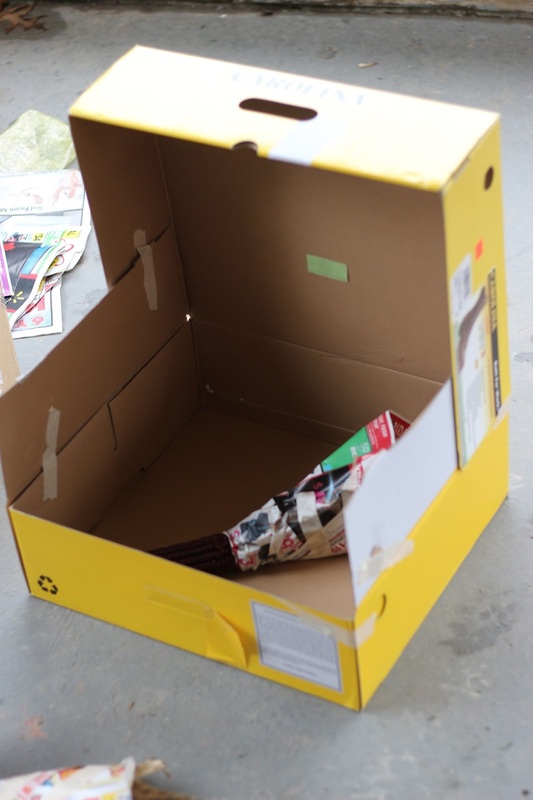 I prefer to spray paint in boxes because it keeps the paint contained and makes for easy clean up. 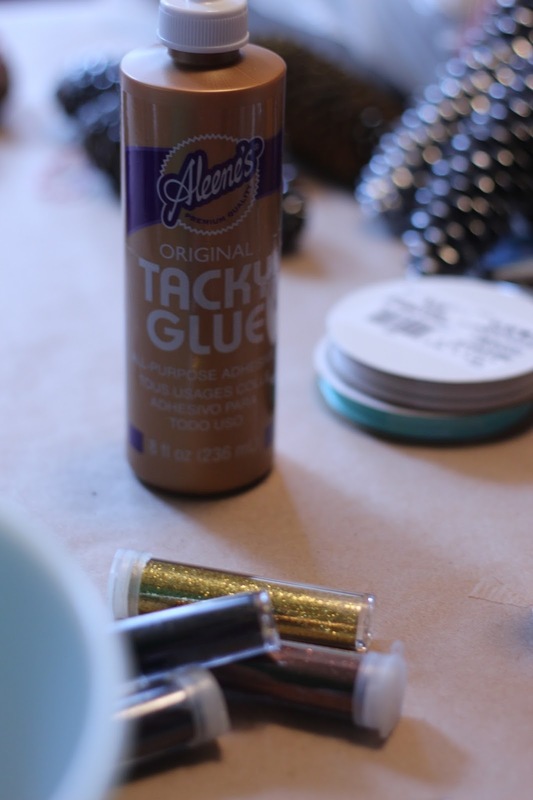 Cover your workspace with a vinyl tablecloth or craft paper for easy clean up, to keep the glitter semi contained, and to keep glue off your table. 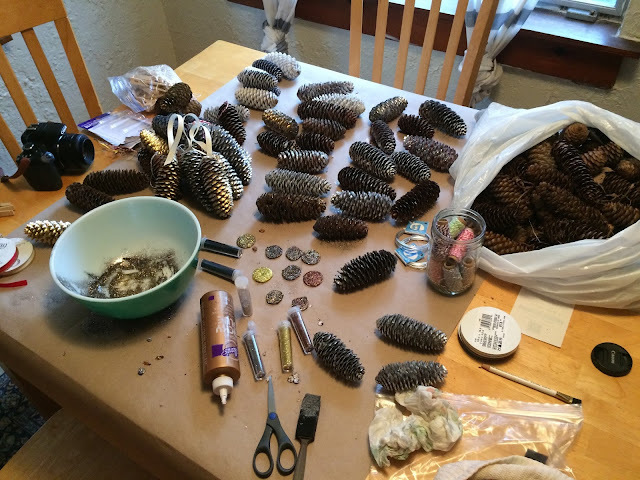 Run glue down the pinecone from top to bottom. 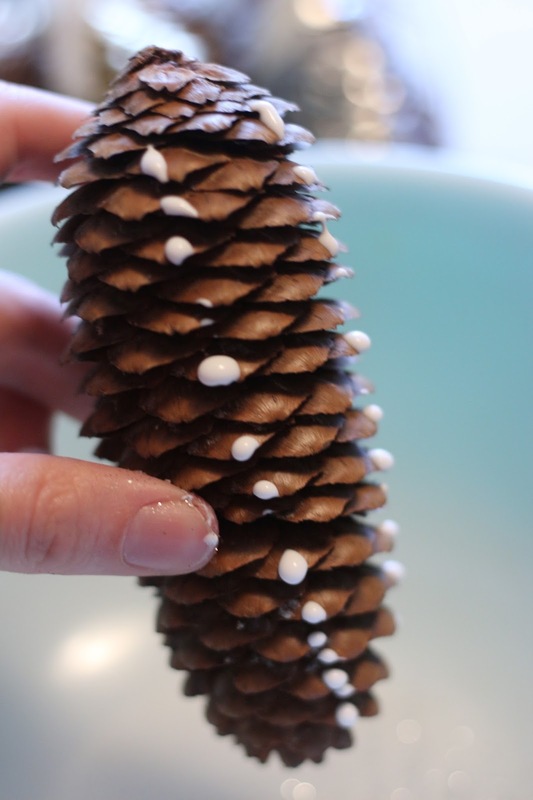 Apply extra to the cap of the pinecone if you want more of a "snowy" look. Spread the glue out side to side using your paintbrush or the sponge. I didn't cover each little 'tab' with glue, but you could if you wanted to. 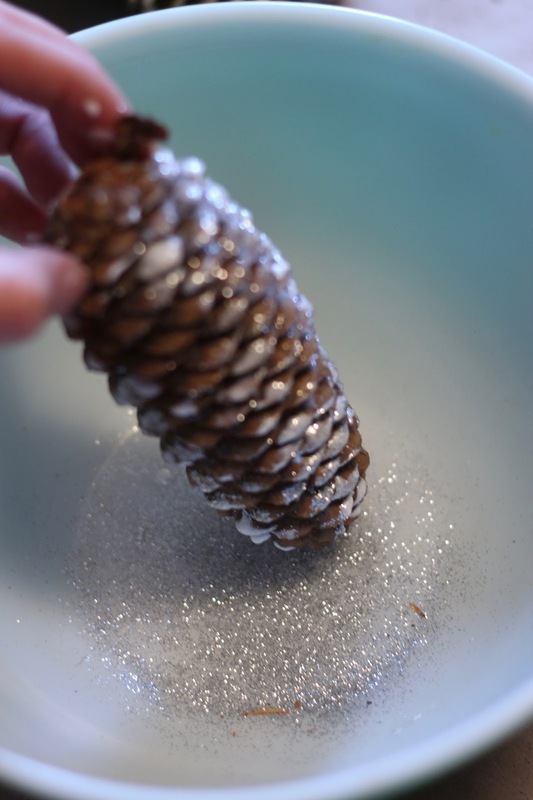 Over a large bowl (to catch the glitter so you can use what doesn't stick), sprinkle glitter onto the pinecone, turning it as you go. 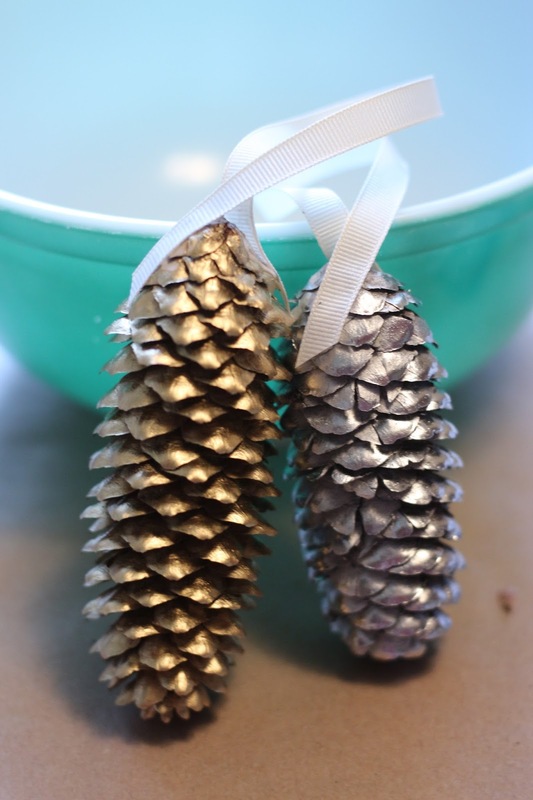 Shake off excess glitter and set the pinecone aside for several hours to dry. After the glue on the glittered pinecones has dried, cut small pieces of ribbon (mine were about 5" long). 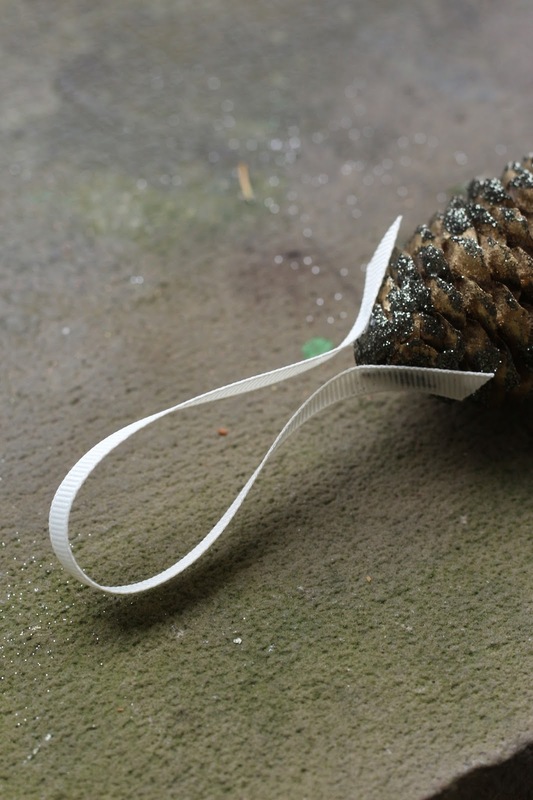 Place a small dot of glue (if you have hot glue, now is the time to use it!) 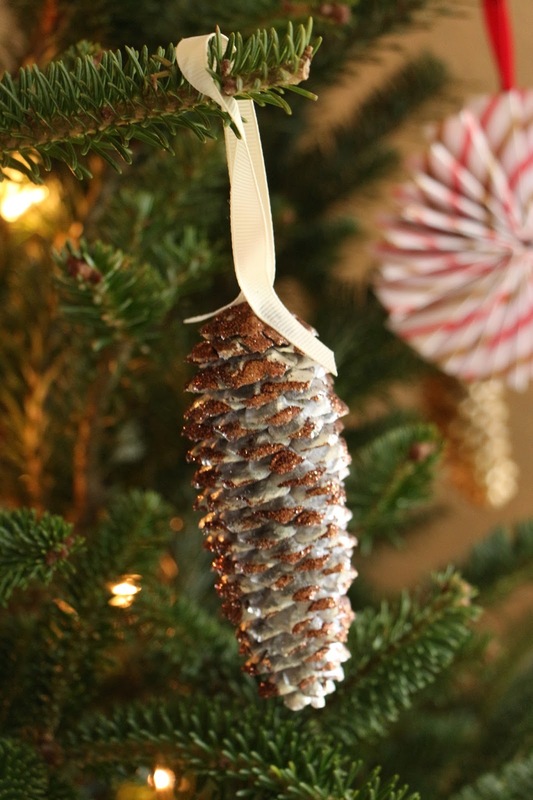 on the top of the pinecone and place one end of your ribbon over each dot. Hold until the glue cools or becomes tacky. And there you have it! Here are some of mine spray painted with no glitter. This one is my favorite. I painted it silver and then sprinkled copper glitter on it. So lovely! 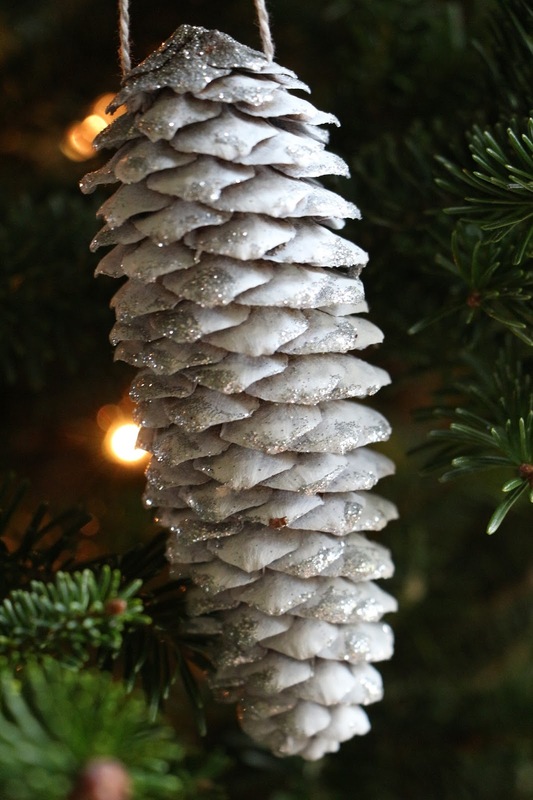 Natural pinecone with silver glitter. Front to back: Gold with green glitter, white with green glitter, silver with no glitter, silver with copper glitter, natural with silver glitter.